“ATRAZINE IS AN IMMUNE DISRUPTOR IN ADULT NORTHERN LEOPARD FROGS (RANA PIPIENS)” is a dose-response study done mainly by Marc A. Brodkin et al. and conducted in Itzick Vatnick’s lab in the department of Biology, Science division at Widener University. This article was from The Journal of Environmental Toxicology and Chemistry that was published by SETAC in 2007. Atrazine is a very common herbicide used in american Agriculture and is a large cause of deaths in amphibians across the country. Brodkin and his colleagues wanted to know if the dose of Atrazine that causes endocrine disruption that leads to hermaphroditism is similar to the dose of Atrazine that would cause immune disruption leading to the large amount of deaths of the species. Prior to this study, there was a study done on the same factors but instead it causing endocrine disruption. Meaning that the hormones in the Rana Pipiens (Northern Leopard Frogs) were being disrupted by Atrazine. This caused hermaphroditism and gonadal abnormalities in males which could later on affect their ability to reproduce. This could cause major problems for the overall species and could eventually lead to extinction if mating is not available. 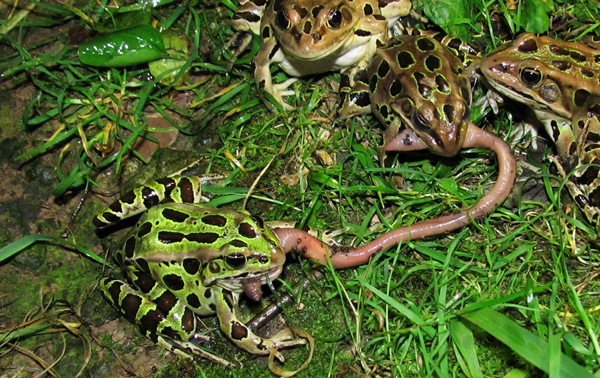 Rana Pipiens are a widely used model organism being used extensively in cancer, neurology, physiology, and bio mechanical studies. Therefore their preservation and safety are key. Another study done by John Wesley Allran and William H. Karasov about how Atrazine and another herbicide, Nitrate, affect the habitat and lifestyle of the Northern Leopard Frog . The study includes tests on the amphibians’ larvae with doses of Atrazine and Nitrate. Contrary to the first study mentioned, They found that the doses given had no significant effect on development rate, percent metamorphosis, time to metamorphosis, percent survival, mass at metamorphosis, or hematocrit which is the ratio of the volume of red blood cells to the total volume of blood. It was found that the Nitrate affected the growth of larvae by slowing it down. Although these studies have polarizing results, It should not be ignored that these chemicals are sneaking into the natural habitats that surround the farm land. What is done in a lab is only controlled, i.e. the larvae were only exposed to Atrazine and nitrate. However in the natural environment these chemicals can seep into the ground water, natural springs, streams, and rivers, and ultimately affect the habitat of a variety of species in different ways. It is unknown what kind of chemical reactions and what products are formed when the herbicides come in contact with the ground water and bodies of water mentioned prior. Because of this measures need to be taken to preserve these habitats and prevent harmful mutations to these animals. Link does not work: email brigatia@go.stockton.edu for journal article.